Eleven little kimonos, ready to be made into blocks for the geisha round robin. The pattern came from the Haru Kaze pattern for In The Beginning fabrics. 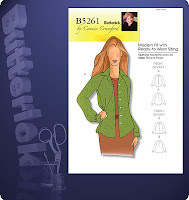 LINK here to the pattern pdf. It is partly paper pieced. The color theme is ivory, tan and black. There were 12 little kimonos, but one was not the right size for some reason. I still can't figure it out - I miscut something, yet the block went together fine - it was just an inch and a half too short. Stay tuned for progress on these little blocks as I put them together and into a border. Then, I picked up two patterns for ebay. 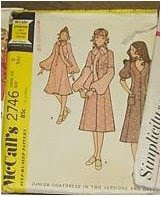 The nightgown pattern, Simplicity 8775, is from 1978. I like long nightgowns. Makes one feel more feminine. This one is elasticized at neck and wrist and looks very easy to make. 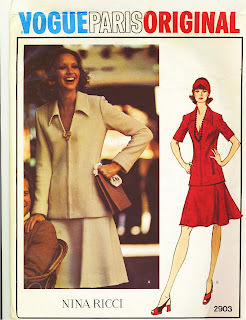 The second pattern, Simplicity 4134, is not as vintage - no date, but I think it is from the past five years or so. Nice asian top that I hope to use with some great fabrics. A few weeks ago, I picked up several vintage patterns at my local antique mall. They are from the 60's and 70's - thought I would share them with you. Vogue 7842 - probably late 60's or early 70's - no date. Labeled maternity, but I remember lots of tops like this that were not. 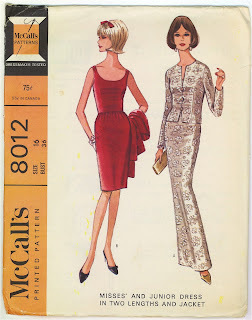 McCall's 8012 - love this 1965 pattern - still looks quite stylish and chic after all these years. 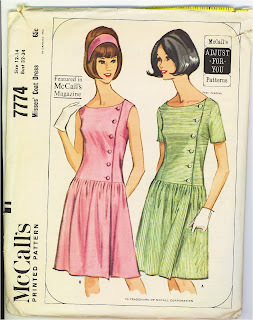 McCall's 7774 - I knew this immediately - 1965. That low waisted look and the Patty Duke flips - yep, definitely 1965. 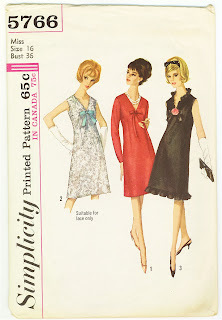 Simplicity 5766 - A 1964 version of a nice, dressy dress! 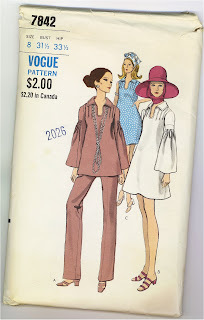 No date on either of these Vogue patterns. I'd place the Nina Ricci squarely in the late 1970's. Not certain about the Valentino - probably about the same era or a bit earlier. 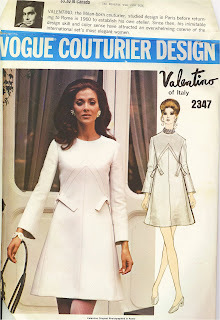 I have seen the Valentino on vintage pattern websites and liked it. Well, really I'm not sure of that. I do know that for the first time in many years, I picked up a crochet hook and decided to experiment. I bought two of the big balls of Bernat yarn on clearance at Michaels, and started to play. After about seven or eight false starts, I came up with this. It is a shawl, quite long, made of treble and double crochets. The first three rows and the last three rows are single crochet. Then I went entirely around the piece with a single crochet, then a treble. Finally, I trebled four times into the areas between each treble. I used a larger hook, a 6.5. The yarn I used is varigated, with blue, green and beige. I picked up some plain blue to add some picots on the edge - I hope it won't be too much, but I thought it would set it off a bit more. Since completing the shawl (which is surprising warm), I've a purchased some cotton yarn and made two dish cloths. The warn is varigated too, white, yellow and blue. It was a smaller hook so a closer stitch. AND YOU KNOW I had to start a stash! The local Hobby Lobby had a clearance sale - $1.99 per skein. I picked up some yarn to make a baby blanket, a varigated purple, dark blue, rose yarn for the center of some granny squares, and six skeins of a rayon ribbon to make a vest for myself. I also picked up some of the ribbon in varigated pastels - only one skein left - to use with something, not sure what, but I really liked it. Besides the crocheting, I have been sewing. I have cut out 12 blocks, and made 5, for a Geisha hanging that is part of a round robin that I flaked out on a year or more ago. I'm not revealing anything right now, but have been sewing when I can. I also cut out the pieces for an 80 x 104 quilt. When I went to the sewing get together in February, everyone was working on a Faceted Jewels quilt. I was immune, until I got home and started to think about the Moda Three Sisters Mistletoe Manor fabric I have. It would be great. So I've cut those fabrics so that the pinks and red are featured in the middle of the quilt, with browns and green sprinkled across, and the browns and greens are featured in the border areas. I haven't started sewing, but it is all cut and waiting. So that is how I've been keeping myself busy. We are getting into the time of year that I am very busy with my grant consulting - usually April through June is mad. I don't know how much I will have to do, but right now it looks like two major efforts due in mid-April. I won't be sewing much if I'm writing. I had this pattern while in high school (circa 1969). I made a great dress in lavendar dotted swiss, and the duster coat in a darker purple. The sleeves are great - slimmer at the shoulder, then from a seam about midway between shoulder and elbow, a two piece sleeve that ballons to a tight cuff with three buttons. I have been looking for it for quite a while. About four months ago I determined to sign up for a search on ebay, as well as check vintage sites frequently. I could not remember who the pattern maker was - I was thinking Butterick, nto McCalls, but I also remembered the yellow block on the left. Well it finally came up in a lot of 20 patterns that is for sale right now. I almost had a heart attack when I saw it. I hope I can win it, I'll keep you posted. Two new things and a potential wadder! I have been sewing the past week or so, but haven't felt like taking photos. The last tinges of winter blahs, I hope. Today is 72 degrees, so maybe spring is here. First up, an apron I made from Simplicity 5201. I have had this pattern for a while - its copywrite is 2004 and it has migrated to the back of the section. I really like the style, but didn't realize you have to pull it on and off over your head. I did a Pattern Review that you can read by clicking on the sidebar link. Then I made a Butterick 5261, a Connie Crawford design. It is pretty basic in design, with straight lines and no fitting. I was hoping that it would fit better, but the neck is huge on me. Because I used a peachy-pink uncut corduroy, I was going for a spring look. Using left over Fresh Cut quilting fabric, I used one pattern for the collar, another for the cuffs, a third to bind the facing and hem, and a fourth mixed with the first three for the covered buttons. I don't think I will make this again - it is too large all over, even though I went according to the measurements in selecting the size to make. Link in the sidebar to the Pattern Review. And then there is this! It is yet another version of the McCalls pattern that I made my loungers out of. It has almost become a wadder several times. First, the fabric was a very inexpensive poly that I bought because I have some great linen in the key lime color that I thought would be great. I ended up having to hand sew the yoke and the hems in. I haven't finished the bottom of the tunic because I was certain I'd cut it unevenly. It doesn't look like it in this picture however. I've had a few pulls in the fabric, but they don't show due to the print. I don't know about it all now - it could still become a wadder!